Good News for investor, SME or Community Enterprises are seeking new potential business which ready to growth and repeatable with Interior material from Agriculture left over, Natural Panel Board. Kokoboard start business from R&D Production line for Wood-Substitute Board made of Agricultural Residue since 1999 by supportive of Royal Forest Department and National Science and Technology Development Agency, for several years. 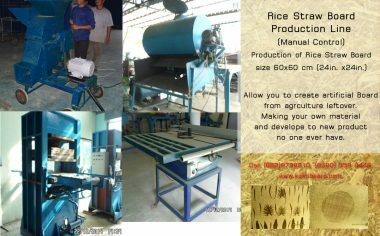 We succeed in developing our own Rice Straw Board and Coconut Dust Board Production Line size 122x122cm or 4.03’x4.03′ with low investment, compared to regular particle board line worth 3.7 million USD., which limited knowledge of making wood-substitute board to big investor only. Kokoboard will open knowledge of making natural board, wood-substitute board, the creative solution to reduce CO2 from open burning in the field and safe our forest at the same time. Today, Kokoboard is ready to get order for Rice Straw Board Production Line size 60×60 cm. with manual control. The reason we do manual controlled machine, as 1. we are SME with budget limit, so we can do this great thing base on what we have. 2. This allow you to develop new material in the future easier. 3. This suit to the budget of SME, Community Enterprise or Food Industry may have waste left after production, they may use there waste to create new material too. There are value addable to this business as you can develop new material to differentiate yourself, your products.